Sydney Shop Girl: Big Brother News. A World Of Small Thrills. Hasn't it been lovely to have a happy headline for once? 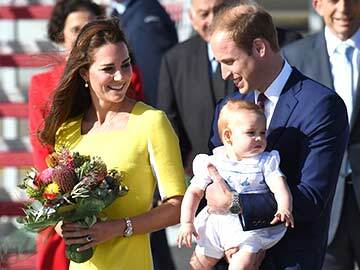 And one that links my favourite Royal couple with new baby news at that! Prince George is going to be a big brother sometime next year while Prince Harry gets to be the cool uncle one more. In other Big Brother news, the 2014 Australian housemates debuted on national television last night. I've had to prioritize and there's only room for one big brother story in my life right now so I'm going with the Royal one and using it as an excuse to buy New Idea and Woman's Day on a weekly basis. There's been a bit of magic in the weather lately. The thick blanket of fog that started us off Monday morning was quite surreal to drive through. And once it lifted, all that sun!! How good was it to be able to hit the peak hour with the sun overhead and some warmth still in the air? I don't know what came over me at 5 o'clock this morning but this is what the bathroom bench top looked like. Black winged eyeliner on a school morning. I use the cheat's method of pencilling in and then painting over the top. Old faves - Hermes cuff, Country Road silk dress, Sportscraft peacoat. Dramatic eyes in place, it was time to face the day with a bit of paisley and a statement arm party. I live in a world of small thrills right now so work with me when I say this but gee I felt a bit free spirited, footloose and fancy free as I swiped the boom gate into the car park this morning. Small thrills they might be but the little adventures that Toddler SSG takes me on often give me a new appreciation of the world we live in. Everyday seems to bring new discoveries and new joys. It's humbling to think that I've been so caught up in the endless lists of to-dos and minor crises of my adult life that it takes a toddler to help me find the fun in the seemingly mundane. Toddler SSG and I went on a little drive to nowhere really on Sunday. It was around 4pm and I was hoping to park the car and start the wind down to bed and a bath but Toddler SSG had other ideas. He refused to get out of his car seat and when he refuses, it'll only end in tears trying to prise him out of it. So I changed tack, took a deep breath and reversed back out and just drove. Down the back streets of our suburb and across into the next subrurb. The roads rolled out before us like black ribbon and regal trees arched over us as we glided past mansions old and new. Toddler SSG craned his neck this way and that, entranced by the new terrain around him. We pulled up at the pier in time to see a ferry dock with a rainbow and the city's skyline glowing behind it. We watched and heard it all in rapt silence. The water lapped gently below us and a slight breeze breathed on our faces. Moments taken out of the seemingly endless grind of work and household running that left me refreshed and ready to get back to it all over again. After a shared slice of thickly buttered banana bread, of course! Hope today is treating you well. It feels as if it's a great day already. My children were 21 months apart and I had no help...my husband was just getting his career off the ground and I admit that I was knackered and young at 26 when my second came along. I would not trade those days for anything though...we do rise to the challenge if it is required. Good points, Mica and Hostess. See both your sides of things. Thank you for the words of inspiration too, Hostess! Your toddler is getting so big! I love that you take him on adventures, and he takes you. That's what that age is for, I think, building the patterns of companionship. xoxo.